Villagers from Kampong Speu’s Treng Trayeong district protest in front of Hun Sen’s house in Takhmao town yesterday. Sixty-six people representing 73 families from Kampong Speu province in a land dispute with petrol conglomerate Sokimex yesterday gathered at Prime Minister Hun Sen’s villa in Kandal province’s Takhmao town to ask for intervention after provincial officials prepared to evict them. Mam Mao, a representative of families living in Treng Trayoeng commune’s Village 3 in Phnom Sruoch district, said yesterday that provincial authorities planned to remove their houses on March 25 and give their land to Sokimex representative Choem Savong. Mam Mao said that villagers had lived on the land since 1992 before a Sokimex representative filed a complaint against them in 2000, claiming that the land belonged to Sokimex. Choem Dara, another representative of the villagers, said that a verdict was handed down against the villagers in January 2001, but villagers were not informed until April that year. Choem Dara said that villagers sent a letter to the Ministry of Justice and a petition to the National Assembly after hearing the verdict and both bodies told them they could return to their homes. “I think that authorities and Choem Savong colluded together to evict and grab 7,500 square metres of our residence land,” said Choem Dara. 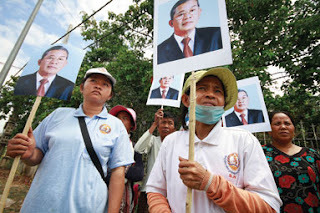 Villager Lai Im said that the villagers would not return until they had received an intervention letter from Prime Minister Hun Sen.
“If we go back now or with empty hands, the authorities will remove and demolish our houses,” said Lai Im. Kampong Speu provincial prosecutor Kuth Sopheang said that a village representative lost the case in early 2001 after the court found that they had destroyed a fence to illegally live on the company’s land. “On March 25 we will lead 172 relevant officials to implement the verdict to declare the return of the land to Sokimex,” he said. Sokimex representative Choem Savong could not reached for comment.